Mega Slam Casino is a fruity slot game made by Eurocoin from Novomatic. It has a very old-school feel about it! 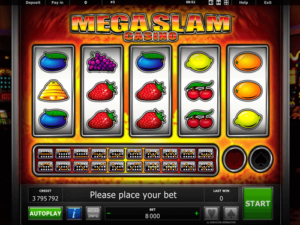 There’s no frills and fancy in Mega Slam Casino. This makes it an ideal slot game for beginner slot players. Some might find this sort of game boring but the traditionalists will love it! Why overcomplicate something that works? That’s definitely what they thought when they were making this game. It doesn’t have any Free Spins or bonus games. It’s just a plain slot that pays out like a true Novomatic game! It’s one of the slots from Novomatic that’s designed to make you remember the good old days. Before everything was digitalized and players began to game remotely from their laptops and phones. Then, the only way to play was on a real slot machine! Standing slot machines were found in casinos and games arcades. You can see that’s the vibe that Novomatic were going for in Mega Slam Casino. In the background, you can see other physical slot machines from Novomatic, like Simply Wild and Club 2000 Casino. Novomatic have been making high-quality and popular slot games for many years. They started off making physical slot machines and then moved onto making online games. Playing online means you can play whenever and wherever you like! Novomatic has many popular online games that they’re famous for. Players really do love: Lucky Lady’s Charm Deluxe, Book of Ra Deluxe, Mermaids Pearl and Dolphin’s Pearl Deluxe. Mega Slam Casino has some mega fruity symbols on its reels. There are five reels in this traditional-style slot game. They spin and stop one by one, from left to right. The paylines pay in the same direction. There are 20 paylines in total and you can see the paths they take across the reels easily. All of the paylines are mapped out and displayed underneath the five reels. There are only 3 positions on each reel. You need to spin the reels and stop them showing matching symbols to win. You can spin and stop the reels yourself or you can put auto mode on. All of the symbols in this game will pay out for three consecutive matches, four consecutive matches and five consecutive matches. Paylines pay the wins so the matching symbols must follow a payline in order for you to get the win! The symbols are: cherries, oranges, lemons, plums, strawberries, four-leaf clovers, grapes, watermelons, bars and golden bells. There’s one exception to the payout rules and that’s the Scatter symbol. The Scatter symbol is a golden logo symbol, reading ‘Mega Slam Casino’. Like the other symbols, this symbol awards payouts for 3, 4 and 5 matches. However, these Scatter symbols can land anywhere and still pay! In Mega Slam Casino, you can gamble your wins. If you want to play Mega Slam Casino for real money, you need to choose a Novomatic casino! To help you decide which one will be best for you, we’ve reviewed the top online casinos that offer Novomatic games. In our full-length reviews, you can read about each of the casinos. Every online Novomatic Casino is different and has different games, bonuses and promotions. You’ll want to choose a casino that offers you the sort of games and bonuses that you really love! In addition to slots, Novomatic also make table games and live dealer games. So, if you like these sorts of games, choose a casino that offers them. If you like to play slots, you might want to choose an online casino that gives out regular Free Spins. If, on the other hand, you like table games, perhaps an online that gives out deposit bonuses is a better choice! For players who like the live dealer games, why not choose a cashback casino? There are many different online casinos that offer games from Novomatic. So, if you don’t know which one to choose, then read our reviews so you can make a good, well-informed decision!